Roundabouts and Empires: New patterns in! We've just recieved in the two new dress patterns from Anna Maria Horner, the Evening Empire Dress and the Roundabout Dress. I always seem to prefer the alternative options for patterns, so it is worth looking at these. You can look at all the options if you click on the 'View more images' button on the product page. 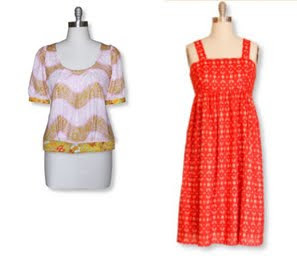 Two great summer makes would be option A from the Evening Empire Dress which would be the perfect everyday summer dress, and the Roundabout Dress has a really lovely summer blouse. 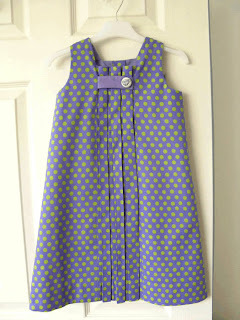 This is introducing the first of a series of pattern reviews by lovely bloggers. The idea is to give you a useful resource for when choosing patterns from the shop. The first of our pattern reviews is by Helen of Angharad Handmade. If you don't already know Helen, she has a lovely blog as well as an Etsy shop where you can buy all the nice things she makes. The review gives you some great information about the pattern, as well as some inspiration... who could not be inspired by this lovely spotty number?! The full review is available here within our articles section on the Backstitch website. We are really excited to announce that we now have in stock two of the three new season patterns from Oliver+S. The Ice Cream Dress (6m - 4 & 5 - 12), and the Sketchbook Shirt and Shorts (6m - 4 & 5 - 12). Two great new patterns both available in the new larger size ranges, and both excellent staple summer outfits. The Ice Cream Dress is a loose-fitting, pull-on smock dress or blouse featuring a one-piece V-notch yoke and button loop closure. Pattern includes three views: a dress with double-thickness hem and matching pockets, a color-blocked dress in the same style, and a blouse-length version of the dress. What about a version in Filigree Plum and Leaf Dots Fuschia? The Sketchbook Shirt and Shorts is a boy’s or girl’s classic shirt and shorts pattern featuring a shirt in two versions: a cuffed, long-sleeve option with a one-piece collar and chest pocket or a band collar and short sleeve option. Both styles include button front placket and shirt-tail hem. Below-the-knee length elastic-waist shorts include front pockets and mock fly. Would look great with Navy Klona shorts and a shirt in Poppy Dot Floral Navy.